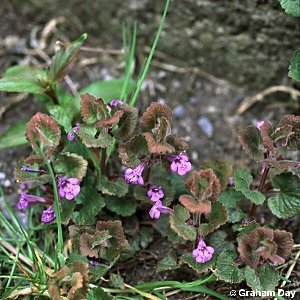 A native, trailing and stoloniferous, herbaceous perennial species of the floor of dry woods or dense hedgerows, with stalked, kidney-shaped, toothed leaves, which have a strong, aromatic scent, and clusters of purplish labiate-type flowers at the nodes. Frequent in suitable situations throughout Northern Ireland. All names: Glechoma hederacea L.; Nepeta glechoma Benth. ; Nepeta hederacea (L.) Trev.